FILE - President Donald Trump speaks about American missile defense doctrine, Jan 17, 2019, at the Pentagon. From left, President Donald Trump and House Speaker Nancy Pelosi. 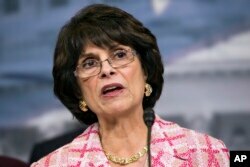 FILE - Rep. Lucille Roybal-Allard, D-California, opposed to immigration raids targeting Central American families with children. Few would argue that a humanitarian crisis is unfolding at the U.S.-Mexico border, as the demand for entry by migrants and the Trump administration’s hard-line response overwhelm border resources. But critics say Trump has dramatically exaggerated the security risks and they argue that a wall would do little to solve existing problems. Trump’s Friday evening tweeted announcement came after Pelosi on Friday canceled her plans to travel by commercial plane to visit U.S. troops in Afghanistan, saying Trump had caused a security risk by talking about the trip. The White House said there was no such leak.